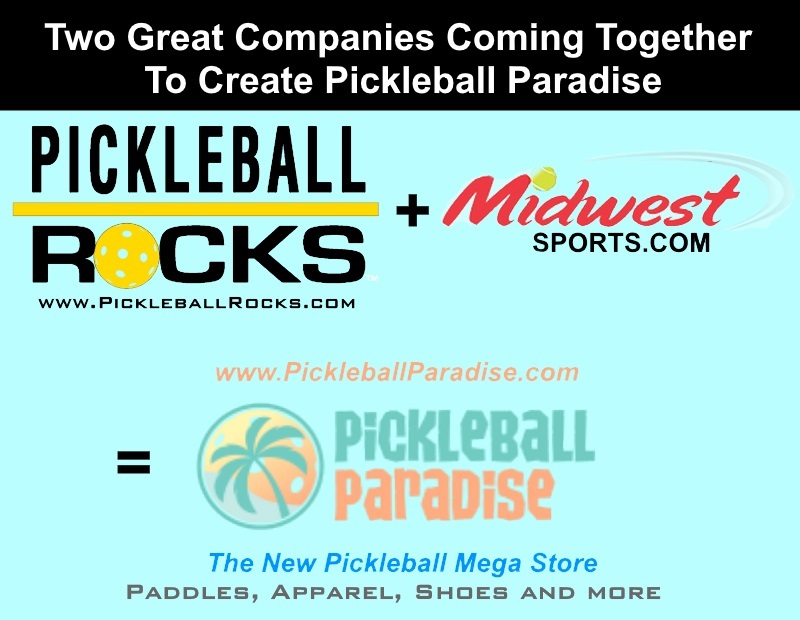 Months in the making, today our Pickleball Rocks team and Midwest Sports.com launched one of the most exciting partnerships in the history of pickleball. The picture on the right shows Rodney “Rocket” Grubbs with Greg Wolf, president of tennis giant MidwestSports.com as we celebrate the launch of PickleballParadise.com. As many pickleball players already know, MidwestSports.com has long been one of the favorite shopping places for a super selection of court shoes. Perfect for us pickleball players, they handle all the great brands and models. But now, get excited, because you will have not only one great place to find your pickleball shoes, but virtually anything you need to play the sport of pickleball. Shoe and paddles and apparel and more! Midwest Sports and Pickleball Rocks have combined our passions to bring this tremendous, new online experience to pickleball. From our Pickleball Rocks standpoint, it was an easy decision. 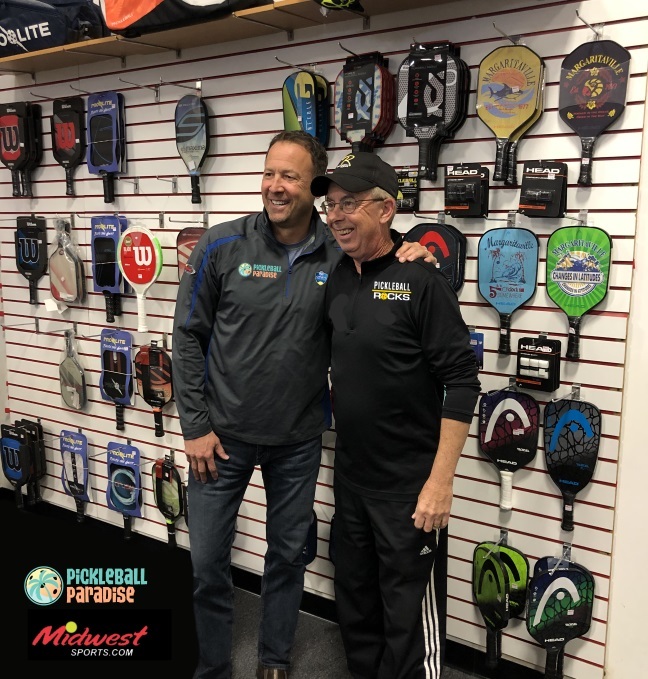 Prior to taking up pickleball and founding the Pickleball Rocks clothing company, we were a tennis family who bought all of our racquets and shoes from Midwest Sports. We have known of the Wolf family for many years so we knew Midwest Sports was a great, family-owned company. That background was very important to us. It is not often that we link our brand with anyone else. But when Greg Wolf called and suggested a partnership with us, we already knew they valued a lot of the same things as our family. We believed it would be a great fit immediately. We don’t take it lightly that Pickleball Rocks has become the largest pickleball apparel brand in the country. We owe it all to the tremendous people who buy the products, and encourage and support our mission to help the great sport of pickleball grow. We couldn’t do it without you, so we feel it is very important for you to know that Pickleball Paradise won’t just be any sales website. It’s mission is the same as our mission. To grow pickleball to heights we never thought possible, but to do it with every player at every level’s best interest at heart. That has always been our commitment to you. We hope you’ll love PickleballParadise.com as much as we have loved putting it together for you. Today we launched, but the website today is just the tip of the iceburg. New products (THINK LOTS OF SHOES, TOP OF THE LINE PADDLES AND PICKLEBALL ROCKS APPAREL AND MORE), new training videos and new fun will be added regularly. Many great announcements will be coming out in the weeks and months ahead so stay tuned, because as you have always known…..Pickleball Rocks! to do some shopping since I have moved on from tennis to pickleball…..
Congratulations to all of you….